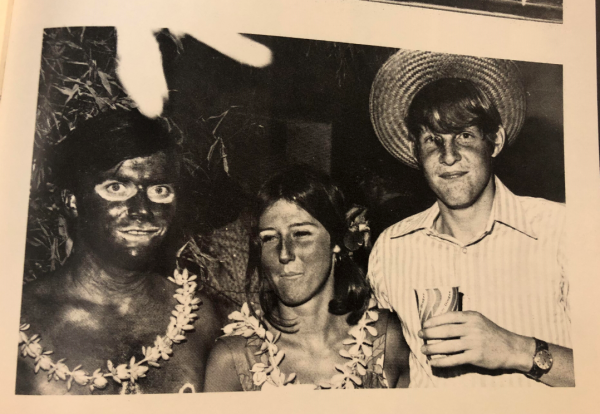 A photo on the Phi Gamma Delta fraternity yearbook page from 1972 shows someone wearing blackface for a costume. After hearing about the recent discovery of a racist photo on Virginia Gov. Ralph Northam's medical school yearbook page, student journalists at the University of Virginia started combing through their school's old yearbooks. What they found was horrifying. A 1971 class member page for the Chi Psi fraternity depicts a mob of black-hooded students carrying rifles, all their gazes fixed upon a lone, black-faced mannequin swinging from a tree. It looks like a staged lynching, as Nik Popli, an editor of the university's newspaper, The Cavalier Daily, noted on Twitter. There were other examples of racist images, mainly blackface, throughout U.Va. 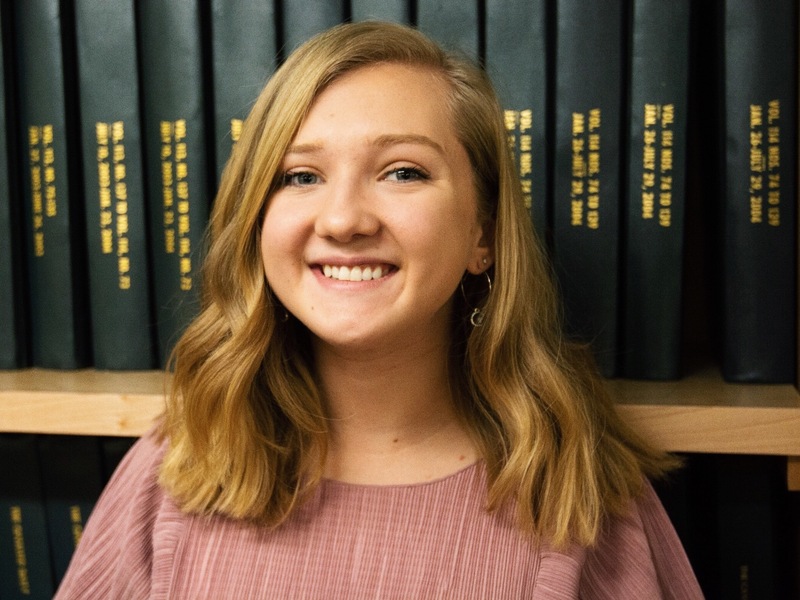 yearbooks from the 60s, 70s and 80s, said student journalist Abby Clukey, who is the managing editor of The Cavalier Daily. But U.Va. isn't the only school to find racist images — like blackface and KKK costumes — in their past. Students and faculty across other campuses in the state have discovered similar pictures, and a recent poll from The Washington Post and the Schar School of Policy and Government at George Mason University found that 11 percent of Virginians have either worn blackface or know someone who has. Blackface was a common pastime in 19th-century minstrel shows. Non-black performers would blacken their skin with burnt cork or dye to portray a caricature of a black person. The practice perpetuated a lasting, racist narrative that painted black people as inferior and contributed to their continued mistreatment. In investigating past yearbooks, U.Va. students are reckoning with the racist history not only of their state, but also of their campus. Founded by Thomas Jefferson, who owned hundreds of slaves, U.Va. was built on slave labor. Starting in 1830, the university used enslaved people from the surrounding area to work on campus. On that same campus, the Charlottesville white supremacist rally turned deadly in 2017. On that same campus, two fraternities were suspended in 2002 after a party where students showed up in blackface. It turns out even the very name of U.Va. 's yearbook, Corks and Curls, has been identified as minstrel slang for the burned cork used to blacken faces and the curly Afro wigs used in blackface costumes. "It really just goes to show that we need to be addressing our history and our really complicated past," Clukey told NPR's Michel Martin. "That's also the sentiment among people I interviewed — we have to be acknowledging the harm that the university has done to the community." Abby Clukey is a student journalist at U.Va. who has been investigating racism in the history of the school yearbook. The yearbook was first published in 1888, but the name hasn't been changed since. Soon after the yearbook launched, Clukey said that there was a contest to "rationalize" the name of the yearbook. The winning submission suggested "corks" were unprepared freshmen, bottled up and too frightened to speak in class, while "curls" referred to students who did so well that they were patted on the head and "curleth his tail for delight." The yearbook folded in 2008 due to inadequate finances, since not enough students were buying it, but around two years ago U.Va. 's alumni association helped revive Corks and Curls through fundraising. This year's yearbook committee is still planning to publish a 2019 issue, according to Clukey, but have had conversations about changing the name. After finding the photo of the staged lynching, The Cavalier Daily posted it on Twitter, where it garnered a lot of disgusted reactions. Clukey has been interviewing students about their reactions and found that the racist photos have had lasting hurt. One student of color she interviewed had just bought his graduation gown. "In that picture that we posted, it looked like they're wearing graduation gowns or something with hoods," Clukey said. "So that reminded him of what he was about to be doing — graduating from this school that is deeply rooted in racism." The discovery of racist pictures on Governor Northam's yearbook page has students and faculty at campuses around the state combing through decades of old yearbooks to see if similar pictures are published in them. The University of Virginia in Charlottesville is one of those campuses. It turns out that the very name of their yearbook - "Corks And Curls" - has been identified as minstrel slang - cork for the burned cork used to blacken faces and curls for the crude Afro wigs that were a key part of the costume. The school's newspaper, The Cavalier Daily, has been looking into that as well as the content of the yearbooks. The managing editor of The Daily, Abby Clukey, has been on that story, and she's with us now from Charlottesville Virginia. Abby, thanks so much for joining us. ABBY CLUKEY: Thank you for having me. MARTIN: Now, there's a history professor at Princeton, Rhae Lynn Barnes, who's done extensive research into the history of blackface and minstrelsy. She wrote an op-ed for The Washington Post, and she said that the yearbook name - "Corks And Curls" - was itself a reference to blackface. And I wondered if you'd ever heard that before. Or have you ever heard anybody on campus talking about that before? CLUKEY: I personally had never heard that before. And from what I've gathered, neither had any of the other students on grounds. MARTIN: So "Corks And Curls" was first published in the 1800s. What does your reporting tell you about the origin of the name? CLUKEY: So after we found out that - through the Washington Post article that the name was a reference to blackface minstrelsy, I looked just on their website. And on that website, they had a page dedicated to the yearbook's history. And they said that in 1888, when the first issue was published, they came up with the name "Corks and Curls," and then they held a contest to determine the best rationalization of that name. And I spoke with the editor-in-chief of the - "Corks and Curls" earlier this morning, and she told me that this story came from a secondhand source. So she took that down to replace it with the preface from the original 1888 edition. MARTIN: And what does that say it's about? CLUKEY: So the explanation is that a cork represents an unprepared student who was called upon in class but who remained silent like a cork in a bottle. And a curl means a student who performed very well in the class and who, when patted on his head by the professor, curled up his tail for delight thereat. MARTIN: Do you buy that? MARTIN: OK. Now, you've been poring over years of editions. And what have you found? CLUKEY: So we went through basically all of the ones from the '60s, '70s and '80s, and we were marking ones that had instances of blackface and other examples of appropriation as well. And most of them were within the context of fraternity parties and things like that. But we did find one that was more sinister. It was what looked like to be a staged lynching. And it was a bunch of people dressed in black cloaks holding shotguns. And they're surrounding a tree where what looks like a mannequin was hanging. And the mannequin's face was painted black. MARTIN: Wow. Well, how have students, faculty and the administration reacted to all these discoveries in UVA's old yearbooks? How are people responding to this? CLUKEY: So the night that we found that particular image, we posted that to our Twitter. And people were quote-tweeting it and voicing their disgust, their horror and some saying that they really were not surprised at all that we found something of that nature in these yearbooks. So professors have been voicing their opinions as well, saying that most people don't really understand the history of minstrelsy, and therefore blackface just was very rampant during the '70s and '80s especially. And students also - especially students of color, like one I interviewed - said that he had just bought his graduation gown. And in that picture that we posted, it looked like they're wearing graduation gowns or something with hoods. So that reminded him of what he was about to be doing graduating from this school that is deeply rooted in racism. MARTIN: Well, you know, to that end, though, I mean, UVA is founded by Thomas Jefferson, who owned hundreds of human beings. MARTIN: The university was built by enslaved labor. And then I think many people remember this very painful episode in 2017 where these neo-Nazis, white supremacists were marching around in the area. I'm just wondering how this all - or does it, you know, fit into conversations that people have been having about all of this history? CLUKEY: I think it fits into the conversation that people have been having. And it really just goes to show that we need to be addressing our history and our really complicated past. MARTIN: ...For financial reasons because a lot of students weren't buying it but that the alumni association relaunched it. Now that there is this discussion about the name, is there a conversation about changing the name? Or what is the yearbook planning to do? CLUKEY: So, as of right now, they're still active. And they are still working on making the next issue for 2019. And I talked to the editor-in-chief, and she said that there is conversation about changing the name. She's been in contact with university officials about how to do so. But change will not be immediate. MARTIN: That's Abby Clukey. She is managing editor of the Cavalier Daily, which is at the University of Virginia. And she's with us now from Charlottesville. Abby, thanks so much for talking to us. CLUKEY: Thank you so much for having me. (SOUNDBITE OF AKSHIN ALIZADEH SONG, "SOUTHERN MAN") Transcript provided by NPR, Copyright NPR.